(7) Lens Caps. Several lens caps can be used with the AN/PEQ-2A for different purposes (Figure G-7). 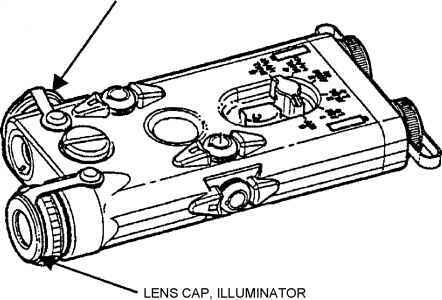 (a) The black lens cap blocks the AN/PEQ-2A illuminator or aiming laser beam should the device be activated. To use the black lens cap, pull it from its stored location on the side of the unit and stretch it over the front of the focus knob or aiming beam so that it fits snugly in place. (b) The diffuser lens cap enables the illuminator or aiming laser to emit in a 45-degree cone (10 feet at 10 feet). To use the diffuser lens cap, pull it over the front of the focus knob or aiming beam so that it fits snugly in place. 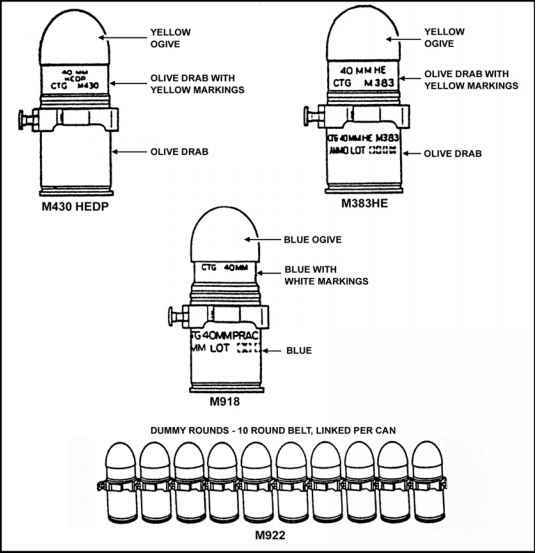 (c) The neutral density lens cap enables the AN/PEQ-2A illuminator or aiming laser to be operated in low power. To use the neutral density lens cap, pull it from its stored location on the side of the unit and stretch it over the front of the focus knob or aiming beam so that it fits snugly in place.